Is USD/CAD Headed for 1.20? After 4 weeks of persistent strength, the Canadian dollar continued to extend its gains against the U.S. dollar. On Thursday it seemed as if a bottom could be in place for USD/CAD but stronger than expected GDP growth in the month of May renewed the uptrend. The economy expanded by 0.6%, 3 times more than expected. This acceleration drove the year over year rate from 3.3% to 4.6%, the strongest in almost 17 years. So while it may be tempting to pick a bottom in USD/CAD, this pace of growth indicates that there is room to raise interest rates. Earlier in the week, there were reports that Prime Minister Trudeau is unhappy about the central bank’s latest rate hike. Whether its true or not the uptrend in oil prices and Canadian fundamentals justifies the central bank’s decision. However for an export dependent nation like Canada the 10% rise in the currency over the past 2 months will eventually catch up to the economy and in turn the loonie. At some point the data improvements will turn into data disappointments and that could start with next week’s Canadian employment report as a slowdown in the labor market is expected after 2 very strong months of job growth. 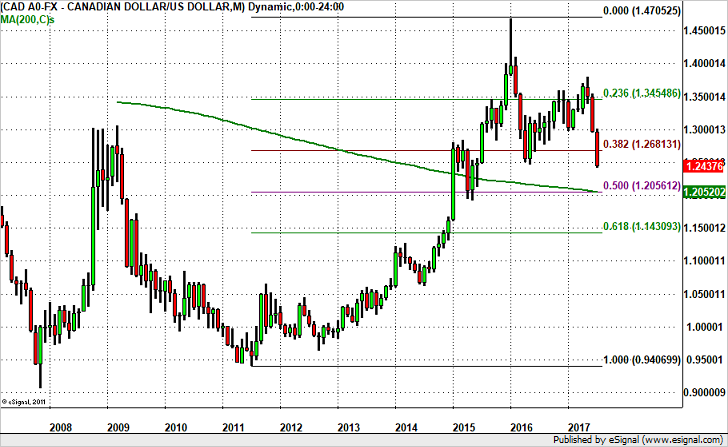 Technically, USD/CAD has broken through multiple support levels. This includes the psychologically significant 1.25 level. The next stop should be the 200-week SMA near 1.2375 but below that as shown in the monthly chart, the main resistance is 1.2050/60, an area where the 200-month and 50% Fib retracement of the 2011 to 2016 rally converge. If USD/CAD rises above 1.26, there could be chance of a stronger recovery to 1.28.